As a long time fan of Julie Kagawa, it’s hard not to have high expectations. Especially when that author decides to delve into the world of dragons. I personally tend to equate dragon lore with high fantasy so that made Kagawa’s unexpected modern take very interesting. The book is told from three point-of-views. There’s Ember Hill, the main protagonist, sister to Dante Hill and dragon hiding in human form. She’s part of a dragon society known as Talon who have strict ideas about how dragons are supposed to assimilate into civilization and how to treat fellow dragons who don’t share their opinions. Ember and Dante have one summer to live among humans and train for a position among Talon. And it’s during that summer that she meets the two other people who make up the narrative - Garret and Riley. Ember has all the qualities I typically like in paranormal/fantasy heroines - rebellious, stubborn, strong-willed. Her craving for independence and unwillingness to blindly follow the rules makes it easy to root for her. But also makes the confusion of her loyalty to Talon (and her brother), the growing closeness to Garrett and Riley’s radical but appealing views understandable. It’s a big choice to make and dragon or not, she’s still a teenager. Granted a teenager who can transform into a huge red dragon, but still! I really liked the premise, core story and even the characters to a certain extent but overall, it failed to hook me. If I wasn’t such a fan of Julie Kagawa, I honestly may have given into my temptation to DNF. Part of the problem is the length of the book. It dragged, especially in the beginning when it was setting the stage for Ember’s summer in a beach town, living with strangers and needing to assimilate (aka make friends). Although it did serve to humanize her character, it could’ve been much shorter. 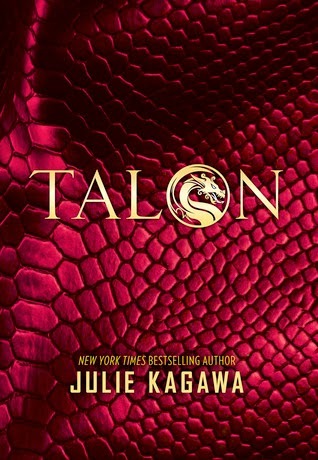 I think in general, if the plot had moved faster and gotten to the point of Talon, St. George and even Riley quicker, I would’ve enjoyed the book more. And not just because I’m impatient! It’s just such a urgent and dire situation and yet I didn’t feel any of that urgency. The book’s pace made it seem like each character had all the time in the world to figure out what to do when that obviously wasn’t the case. And while Ember and Garrett's characters were more or less fleshed out, Riley still fell flat by the end. The reviews for this book have been pretty 50/50 and unfortunately I fall on the side that felt this book was “just okay”. I do recommend checking out Julie’s books but maybe start off with her earlier work before giving this one a shot.